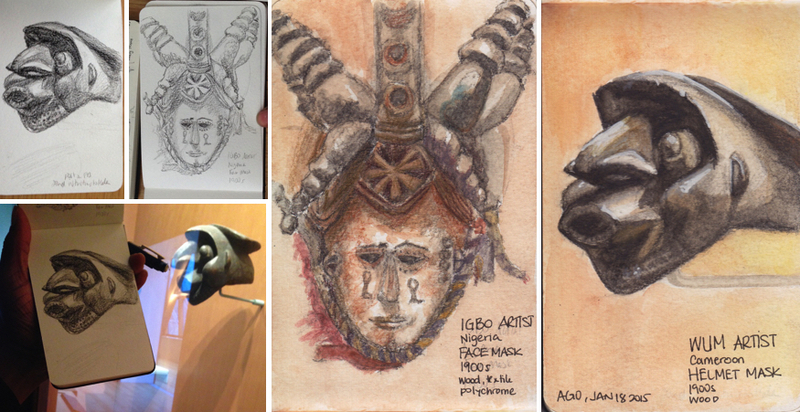 A couple of us went to the AGO to sketch some of the art on display from one of their permanent collections. There's quite a lot to see at the AGO, so we mostly focused on the artwork in the Henry Moore Sculpture centre and the "African room". For some reason, there's no name associated with this room on the map but it looks like most were donated by Dr. Murray Frum. The results from this little sketching session are quite fabulous. Most stayed in the area and created great renditions of the what you see inside and outside the AGO's second floor. Some also ventured into other floors and discovered great little gems throughout the gallery. (Check out the Toronto Urban Sketchers blog for a sneak peak at their sketchbooks). 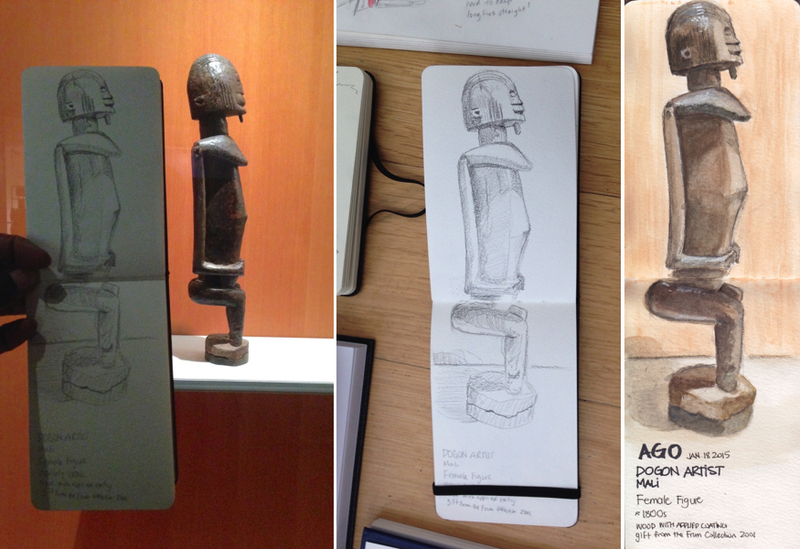 I decided to stay in the African room and drew three of the sculptures and masks exhibited. Since we're not allowed to use watercolour in most room, I used an Derwent Inktense pencil (introduced to my by a fellow sketcher not too long ago) and added colour later on at home. I love using this pencil. They are water-soluble and lately far I've been using a black ones to created the shaded area almost like an under painting, and added watercolour after that on top of it. There wasn't a lot of information on the sculptures and the masks other than the material they were made out of, where it came from and what it was. I guess I've been spoiled touring some of the museums and galleries in DC, but it would be great to know what was their purpose was and what they represented at the time the were made.